Like a new mystery novel whose ending cannot be predicted, a new home is full of unportended discoveries. 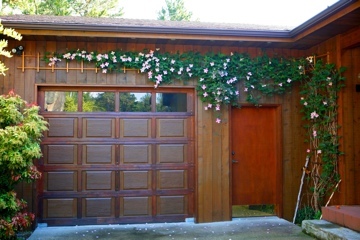 Who’d have guessed a garage wall could delight the eye upon every arrival home? 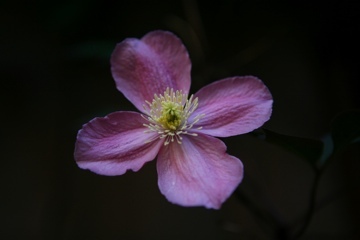 My meager research indicates this clematis as a ‘Montana’ variety — no scent, but a perfect harbinger of sunnier days. Beautiful. 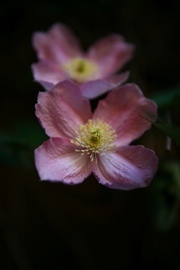 To my eye, like the wild rose, these lovely clematis are the perfect form of their?? ?Okay help me here – not species – what is it in plant speak? Not sure about the plant speak. Species? Genus? Phylum? Garden pics will come on my return from camping.